In the northwest region of India lies the colorful state of Rajasthan. Known as the Land of Kings, it’s home to an arid, desert terrain marked with the remnants of a rich and powerful past. In each vibrant city, there is an impressive ensemble of majestic palaces and magnificent forts and a plethora of sun-kissed rooftops where you can soak it all in. 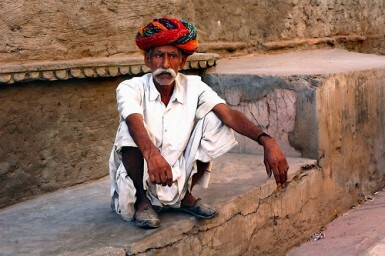 When you picture India, it’s likely Rajasthan you have in mind. Here the clanking sound of sparkling bangles and silver anklets is hushed against the taunts of sari stall vendors pushing intricate fabrics. Bobbing through the narrow alleyways of endless bazaars, there’s a sea of brilliantly colored turbans bantering at the spice markets. It’s India at its best. We spent three weeks uncovering the splendor of the enchanting state. Here’s a look at some of our fondest memories. It’s hard to forget your first sight of Udaipur at sunset, and that’s why we stayed so long…to do it over and over again. Udaipur has a fairytale setting. It’s built around a group of lakes, mountainous green hills and floating royal palaces. Dubbed India’s most romantic city, we celebrated Ryan’s 30th birthday here and lived like royalty. Thanks to our generous parents, we were treated to a spa day at one of the city’s lavish hotels and enjoyed a private, palatial dining experience surrounded by hundreds of twinkling candles on a bed of marigolds. We fell in love with the elegant haveli where we stayed. This 300 year old mansion is a structure built for India’s elite where all rooms are centered around a courtyard. We enjoyed calling this place home for our brief stint and spent many a hours on its rooftop terrace enjoying the spectacular views. The town of Jaisalmer sits amidst the sands of the Thar Desert. As India’s ‘Golden City,’ the windy streets are lined with honey-colored temples and havelis. Suffering from an extreme case of dehydration, I couldn’t muster the energy to accompany Ryan on exploring the sandstone castle perched above the city. I was saving my energy for our trek out in the desert. On the back of camels, we wandered through the rolling sands of the Thar Desert, bringing us just 30 miles away from the Pakistani border. Here we set up camp for the night. Wrapped in blankets on a bed of sand under a full moon, it was a night to remember. As I said, Rajasthan is big on colors. That brings us to Jodhpur, the ‘Blue City.’ Here the Meherangarh Fort (one of India’s best) is dramatically perched over the blue city skyline. Long ago, the people of Jodhpur added indigo to their white paint as a way to keep away pesty insects and keep their homes cooler in the desert summer. Whether it works or not, I can’t tell you, but getting lost in the blue maze of the city at sunset was a brilliant experience and likely any photographer’s dream. For the mere 10,000 people that live here, Pushkar packs a memorable punch. This holy city has more than five hundred temples and strictly forbids meat, eggs and alcohol. There are several bathing ghats in the center of town (looking to be no more than dirty pools of water) but actually are one of the holiest of places. Bathing in the ghats is said to cleanse the soul of impurities, attracting hundreds to the water each day to get their scrub on. A rare sight was seeing the traditionally and obsessively modest Indians here bearing it all as they slipped into the murky waters. As a visitor to the ghats, we were invited to partake in a puja (prayer) session. Our puja entailed a priest asking us to repeat prayers while sprinkling rose petals and rice into the holy waters. Aside from the holy rollers and strange pilgrims crawling all over the place, our favorite memory of Pushkar was at sunset. 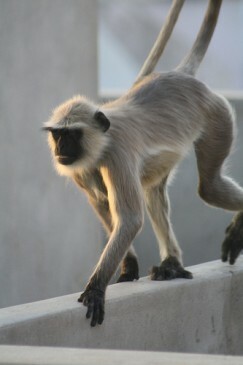 Atop the rooftop café of our hotel, we were captivated by the sight of monkeys jumping rooftop to rooftop as the blood-red, desert sun dropped behind the white-washed temples and soaring mountains. Looks like you had a fabulous time! You’re right about it being difficult to take a bad picture here in Rajasthan! There’s a photo opportunity round every corner! Did you get a chance to visit smaller places like Ranakpur and Alwar? Now you’ve seen the big sites, its definitely worth coming back to see more “off the beaten track” locations another time! Good luck with the rest of the journey! 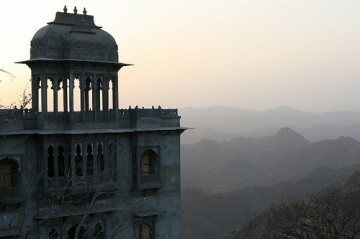 @Mina – It’s hard to take a bad photo in Rajasthan, that is for sure! Simply the most photogenic place I’ve been. Thanks for the kind words. .-= mina´s last blog ..afternoon tea =-. Ah, forgot to mention the reason they don’t allow eggs in Pushkar is because it’s a total vegan town, meaning no meat, no eggs and no dairy products. They actually do serve ‘omelets’ using no eggs, only vegetables. Really interesting city. 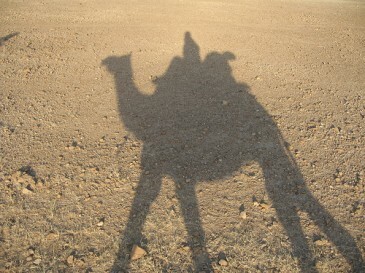 Hi Sofia – Glad you enjoyed the Rajasthan photos! It was definitely one of our favorite stops in India. Each city was so full of color and history. Could have spent months there soaking it all up. We just met a Kiwi guy who is buying a camel to explore Rajasthan. Now that’s an adventure we’d like to have! I loved it there too, want to go back there again soon and stay a bit longer. 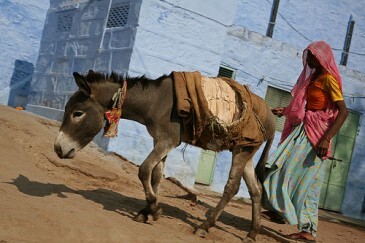 Love the pictures, especially the one “Walking the blue city streets of Jodhpur”. .-= Sofia – As We Travel´s last blog ..Weekend Reading – Best Travel Blogs From Around The Web (4-9 April) =-. For me there is something magical about India. Everything is upside down but still somehow so right. Love the picure of the man in the turban! How come they don’t allow eggs, is it because it’s an animal product? Do they forbid cheese as well?